We have two school construction sites to supervise and monitor right now – which is a first for us! But taking on a challenge is always welcome! Progress is going great at both of them! Our Dad Elementary School has the foundation dug, compacted and poured (competed Saturday) and the walls have begun today (Monday)! By the end of the week we are expecting to see it completed and ready for a roof. Things are moving along at an great pace and the construction crew is enjoying the students’ excitement as they watch their newest addition going up….and also challenged to keep them at a distance 😉 The students and staff at St. Joseph’s High School in St. Thomas, ON and the St. Anne’s Apostolic Community in St. Thomas are to thank for this work happening! We are so fortunate that they have been such long time supporters and believe in what we are doing in the Bugembe, Uganda community. The other construction happening is back at our first school build project. Nanso Primary School is having the gutters removed as the water load during the rainy season is way too much for the gutters to handle, especially since it runs downhill so as you get towards the last gutter it has to handle the water-load from all 4 previous roofs plus its own! The rains are so heavy in the rainy season that we will be able to fill the tank to capacity in just ONE day! This amazed us since it is a 5000 L tank! The improved gutter is a different style, far more robust and is the same kind we learned about through Fr. Denis and the upgrade work we had been overseeing there on behalf of St. George Parish in Byron, ON. The second repair was pretty minor, but very significant to the school. The water tap was blocked and the water from the school’s tank was not coming out for months now because random people in the community (not kids at the school, but adults!) had shoved sticks up the pipe that connects the tank to the tap to try and get water out at night! We always remove the spigot head to prevent the water from being taken by anyone outside of the school so the fact that our foresight was just not enough of a preventative left us very disappointed. We did not expect this! The situation was annoying to everyone at the school, but we luckily were able to find a way to fix it. At our “Canadian construction consultant” Sandy’s suggestion, we ended up using a long drill bit on a manual drill (called a “breast drill”) since there is no electricity in Nanso, and drilling down the metal pipe that runs from the tank into the tap which was jammed to get all the sticks crushed up and out. It was a success and we added a new tap with a lock that will prevent this from happening in the future. This kind of expense and unnecessary repair is one that frustrates and disappoints us. However, the hilarious dance-celebration from the kids when it was fixed was a reminder of why it mattered and was worth it! Having a clean and safe water source for the students at the school is very necessary, and this is the only access in the community. We could not turn away from this problem and we are happy to report it is now greatly improved between the new catchment system and locking tap! Lastly, Nanso is also finally having the gaps in the roof peaks bricked in – we have put this off for so many years, and we kind of got lucky no damage from the winds has happened so far. The noise from the rains and winds during the rainy months of March-May and October-December make it almost impossible for the teachers to teach their classes. In addition, we needed to seal it off from bats taking up residence again! So this work is long overdue and the staff is very happy when we told them of the plan and that we could even get it done all on the weekend to avoid disrupting classes with construction. This of course didn’t keep the kids away as many of them hung around all weekend to see all the construction action taking place. We will be able to see everything complete at both of the construction sites a week from now. Crossing our fingers that everything continues to move ahead as smoothly as it has so far! 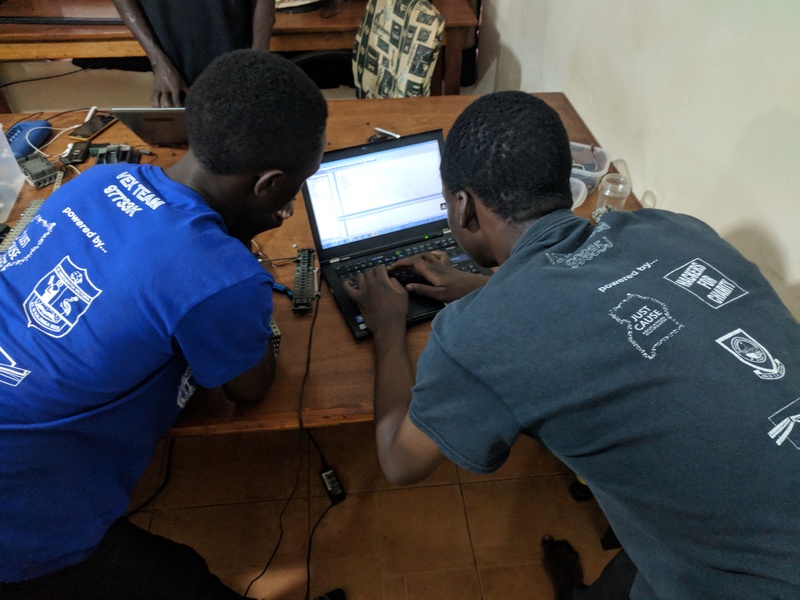 We opened up the Hackerspace for the Jinja students first thing in the morning. They were tasked with doing a proper cleaning & full organization of all the equipment, tools and storage room. It probably comes as no surprise but 20 teenagers are not overly tidy when they’re self supervised, nor were they thrilled about a mandatory (massive) cleanup effort. But, we locked up the drone and the laptops until inspection time which would be later that afternoon. They immediately got started – the place means too much to them not to! In the meantime, we set off for Nanso Primary School to deliver school kits to each individual student (thank you to the LDCSB schools St. Nicholas and St. George in London, ON!) and teacher and classroom kits and equipment. Nanso has all 7 grades of classes now from Primary 1-Primary 7 and has been successful in recruiting 2 qualified teachers to take on the upper level classes. We immediately saw two very noticable improvements in the school. The first was in the English spoken by the students! This is something we have been working hard to address at Nanso as English is the official language in Uganda and all of the curriculum and instruction. It’s important that they don’t use local language when teaching as the government exams at all levels are all in English. As a result, student success is dependent on both the subject knowledge and grasp of the English language. There second thing we saw in terms of improvement was walking in to see teachers outside with their students on the school grounds doing a live science demonstration! There was an actual outside the classroom hands on learning opportunity for students happening! The class was exploring how weather and water run off effects soil erosion – a very significant factor in Uganda, especially in Nanso with the amount of rocky soil and very limited vegetation. For us, this indicates a huge step forward in terms of the quality of teaching and education offered at the school as it was at last evidence of some non rote instruction and some active learning! From an outside or Western perspective, this probably seems like a tiny anecdote to write about, but from the inside it was one of the most promising and uplifting moments to witness in a long time at Nanso! We have led many hands on activities ourselves or with our volunteers at Nanso over the years, and have spent considerable time meeting with and attempting to guide teachers, offer teaching development opportunities related to the concept of hands on and getting outside of the classroom walls and away from the blackboard. But, we had never seen this teaching initiated by the teachers without us there. The new teachers are clearly moving the school in the right direction and the quality of education for the students is surely benefiting! We will continue to offer PD sessions, which the school staff really does want and appreciate, but it has to ultimately be internalized and put into practice through their efforts and initiative. We are so happy to see this finally for the first time! Another element we’ve been wishing for and needed for a long time on site at Nanso is some construction expertise. We were fortunate to have someone here helping us from Canada (Sandy) who brought building knowledge and construction skills! It allowed us to to an assessment and brainstorm some solutions to the long ongoing issues with the first school building. We now have a solid plan in place now to help finish the roof, the gutters, deal with runoff that is damaging the low walls on the building, repair the water tank and get rid of the massive spiders that have taken residence all the way around the roofline. The biggest spiders are the size of your hand (!!) and they pack a punch if they bite you. No one in the community was certain which spiders were poisionous and which weren’t so the best thing to do is just get rid of them all, for good. So that will be happening in the next 10 days as well as closing in the roof, revising our gutter system and making repairs to the water tank. We briefly greeted some of the parents on the PTA which we set up a few years who were headed to a meeting and then set off on the boat back to Jinja – for the offical inspection of Hackerspace… The final positive of the day was that they passed the “official” “Just Cause Kumi (ten) Point Inspection System” and will be able to access the laptops, robots and of course the new drone again tomorrow. A very busy but very successful day! We have two construction sites on the go this year so it’s going to be a pretty exciting and action packed couple of weeks – Stay tuned for progress updates! Heading out to Nazigo town from our home base in Jinja is always a full day affair, and it was no exception this time. We arrived at the parish in Nazigo and were greeted by one of the Kasaga community leaders, our long time friend now, Vincent, who drove with us the rest of the way down a tiny dirt road out to the outstation churches built by St. George Parish in London, Ontario. The road was extremely eroded and rugged, moreso than usual due to the rains, so it took us about 35 minutes to travel just 10km. We were greeted in Kasaga at the church by cheers and song and dancing and the traditional “Aiyaiyaiyaiyai” chants of the community. The parishiners were so very thrilled to have us there and especially for the new visitors, Sandy & Elizabeth, because they were from the parish in Canada (St. George) that built them St. Kizito. It was a vocal outpouring of joy that makes us a little uncomfortable but is so genuine and humbling you get over it very quickly and just feel happy to be there and share in the moment. We initiated a tailoring training co-operative 2 years ago from within the side room of St. Kizito church and we saw fast progress with the first garmets created last year. They were making good use of it then, and were just in need of a teacher that could teach them beyond the basics. Well, they now have two tailoring teachers and they certainly have improved and are making the most of the opportunity. The women using the co-operative have learned to make far more than the basic shirt design they had the previous year. They are now making many different types of garmets including: 3 different styles of dresses, school uniform pieces, long sleeve shirts, short sleeve shirts and shoulder bags. One of the teachers, Jen showed us samples of her students’ work and explained a number of the skills that she is currently teaching, the big ones being collars and facing. It was really impressive to see the visible evidence of the progress in learning from this centre a well as the obvious pride in the work from the students present as they held up their current projects. We then returned to Nazigo and went to meet with the new headmaster, Headmaster Constantine, at St. Mathias Kalemba Secondary School where we set up our second makerspace last year and established a second robotics team, the Fusebots. We wanted to discuss and explain the program to him and set up meeting times and dates so that we had some offical time to insure that he is informed about what we do at his school and that he is on board. He has only been there for two months now, so it was good timing to meet him. We set the meeting up for next week and then got to tour the campus and check out the huge renovations he has initiated already at the school. It’s very impressive and we were really happy to hear that girls were a priority to him and their bathrooms, washing facilities and dorms were being renovated first. He also said, without prompting, that he wanted to see the girls more involved with our technology programs. We’re pretty sure as soon as he drives a robot upon our return he’s going to be all in and ready to become a full fledged nerd! We will also be having our offical team meeting with the St. Kalemba robotics students and their computer teacher in the next week. We will also be delivering their long awaited laptops and missing robot parts and upgrades. Definitely something to look forward to in our return next week. We’ve been wanting to get some clear airal images of the land surrounding our schools in both Nanso and Bugembe as well as the Nazigo area where our tailoring training centre is located. These areas are quite remote and poorly mapped and we are trying to get a better understanding of the community regions we are serving to help us address some of the challenges praticularly related to access. -engaging Ugandan youth in community service and volunteer opportunities that specifically apply and enhance their technology skills. Needless to say, it’s going to be a busy month! We have a team of two Canadian volunteers with us who are none other than Michelle’s dad (Sandy) and mom (Elizabeth)! It only took 7 years of convincing, but they are finally here and it’s pretty exciting to be hosting family members…. And putting them to work 😉 It has been a crazy busy 2 days. So far we’ve used the evenings to prepare around 200 student school kits and 20 teacher and classroom supply kits. This was largely the result of Sandy & Elizabeth contacting local elementary schools (St. Nicholas, St. George and St. Joseph’s) prior to their departure and asking if they could help with a school supply drive. Obviously given how many kids we put together, the response was tremendous! Organizing and packing it all into individuak kits took a solid 4 hours! We also had some afternoon time to round up additional classroom supplies in town and get some updated prices on building materials for the school. We had to meet right away day 1 with Michael, the headmaster and director of Our Dad Elementary out in Bugembe to see where we were at and establish a timeline for the work. He was able to get some locals to begin digging the foundation for a grade 1 class immediately. The great 2s, as his largest class (86!) couldn’t fit into any other room but the new one we build last summer so the grade 1s were annexed out in December! They we’re thrilled to hear they would soon be back in a permenant classroom of their own… As was their teacher! We are thrilled to report that the inaugural Just Cause Education Outreach Robotics Tournament was a huge success on Tuesday! 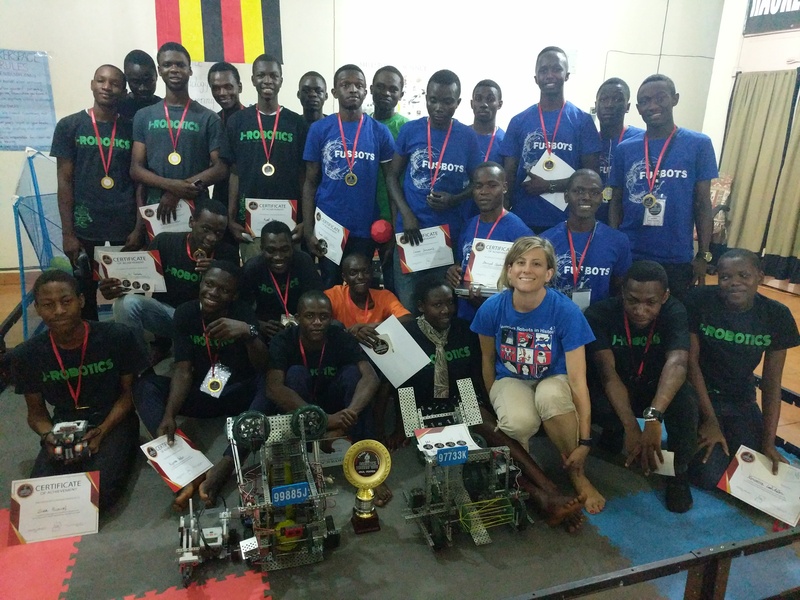 After 6+ months of planning and preparations, including developing the official rules, signing up teams, finding sponsorships, equipment and arranging everything from the official game rules, venue, transportation (which Ugandans refer to as “TP” and we find pretty hilarious), locating media coverage, finding sponsorship/grant money, designing & ordering certificates and meals…. we somehow pulled it off!? We have been planning this since July when the students from our two robotics teams from neighbouring cities wanted to have a competition. We proposed a tournament to take place in December as a culmination to the year. In September we released the rules to each of the teams and they had to use the same parts to design, build and program two different robots to compete in the tournament. 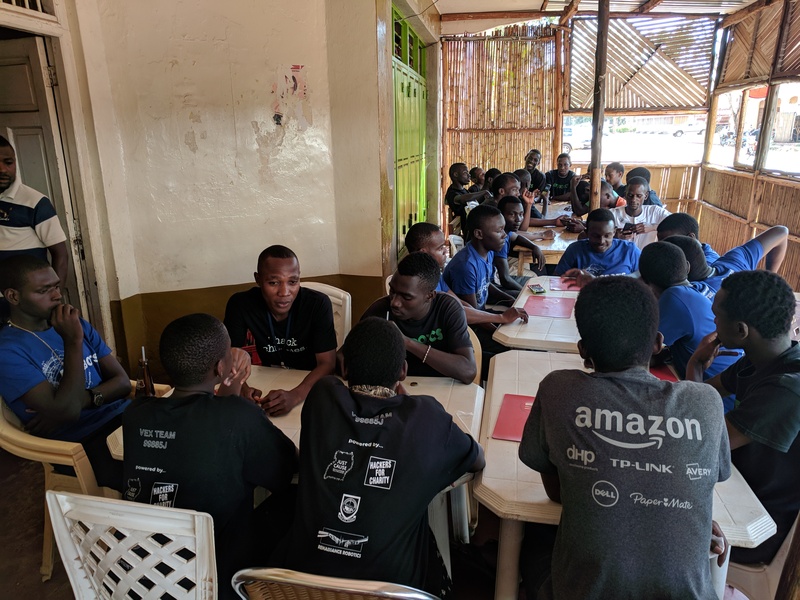 Upon arrival in Jinja on Friday, the last minute questions came flooding in from both teams and we did our best to respond to them or find them help from other teams and mentors. We had to address a lot of concerns, and provide a lot of clarification and encouragement. We were nervous, the teams were nervous and our volunteer committee was nervous, having an equal number of questions and needing a lot of clarification too! Since schools in Uganda were out for Christmas break it meant we had to deal with transport from many different places to insure that students did not miss out. Since schools are boarding schools, most of the students from the Nazigo team had returned to their villages for the holidays 2 weeks prior to our arrival. Many students were in a panic contacting us concerned that they couldn’t get there due to the cost of the matatu (about $5-$8 per student, return) and they did not want to be “cut from their team”. Of course being cut was not going to happen, but we really wanted them to all be present after their hard work and to experience what we knew was one of the best parts of being involved in robotics – competition! In the end we hosted 16 students from J-Robtoics (Jinja) and 8 stduents from Fusbots (Nazigo) as well as their school’s computer teacher. The teams arrived at 8am as did our 6 event volunteers all ready for the day to get going. A Hive of Activity in the Pits. The day started out with some work time in the “pit area” where teams could get things assembled and then calibrate and test their robots on the game field and robot arena. This early in the day we had a major highlight – giving the Fusbots their surprise brand new team T-Shirts that they didn’t know were coming, and the new members of J-Robotics who earned their place on the team got their team shirt too. We have an earn your shirt system by keeping attendance and having the students document their work in the makerspace, especially leading up to events like this, so that they are merit based and decided upon by the veteran members. Otherwise we would have kids just showing up for a free shirt! It has become a really big deal to earn your shirt on J-Robotics and we made sure to explain it to the Fusbots and their teacher so that they would be able to hold on to the extra shirts until it was “time”. Following the “shirt ceremony” and work in the pits, each team had the opportunity to present their robot to a panel of judges who had a very comprehensive format to follow. The judges were very inspiring and meaningful to the students involved as they were Ugandan University students that we knew who were in their last year of study in computer science and engineering. They were the perfect fit and the students were very excited to be evaluated by such experienced, knowledgeable judges. The teams took the process very seriously. Students were interviewed, and their robots evaluated based on everything from mechanical design, their code, the strategy, teamwork, wiring and safety. They had to present their biggest challenges and successes as well as talk about both the hard skills and soft skills they developed throughout the whole process. After judging and inspection for legal parts and safe operation, VEX robots were first up. This was a head-to-head competition called “Free-for-all” that was kind of like basketball with several twists including a whole lot more balls, an autonomous bonus at the start and an end game “hot potato” style challenge. Matches were only 3 minutes in length but they were INTENSE! When that first goal was scored, it marked the first ever VEX goal made in Uganda and it was a pretty exciting moment!!! We were just so relieved to see both teams get on the field, have operational robots and that our referees and game officials understood what to do to make things run smoothly that we can’t believe we managed to be focused enough to capture this on video! We had a friend who contacted one of the reputable Ugandan news services “The Daily Monitor” and they sent a reported to cover the event. It couldn’t have been more perfect timing for her to walk in just as this first goal happened! pretty tasty and definitely a LOT of food!) Of course, as expected, despite checking in multiple times the last 2 days, the restaurant did not have the restaurant setup after we walked everyone there and they were scrambling to get enough tables and chairs crammed in to accommodate all of us while 34 people stood out in the blazing December sun waiting for 10 minutes. The kids didn’t even blink, this is pretty standard protocol in Uganda, and it is always us outsiders that were being impatient and hangry! The meal was a lot of fun and the kids, like typical teenagers ate and ate and laughed and took a million photos and selfies and made a lot of noise and had an absolute blast! go Mindstorms NXT robots. This event was a collaboration with our friends from Team 4525 Renaissance Robotics in Canada so we started up the Google Hangout so the Ugandan teams could watch and time the Canadian team and vice versa. There were 3 events total and each of the teams had 3 attempts. We had a lot of fun cheering for the robots as they set and broke course records and watching in agony when they faulted! It was very equally matched in this event and all of the students thoroughly enjoyed meeting one another and sharing their common passion for technology. When you see the students working in their teams on their robots and during competition you cannot describe what you are seeing in action as anything but “passion”. J-Robotics – 2017 Tournament Champions! At the end of the day our judges Ben and Latif tallied their judging score cards and Liz, Joel and Emma added up the final scores from VEX and all 3 Mindstorms events and came up with the winner for each individual event and the overall tournament champion. J-Robotics won VEX over the Fusbots and the NeXT Winter Games went to Renaissance Robotics followed by the Fusbots in Second and J-Robotics in third. Students were awarded medals and certificates for their accomplishments as well as some event stickers. 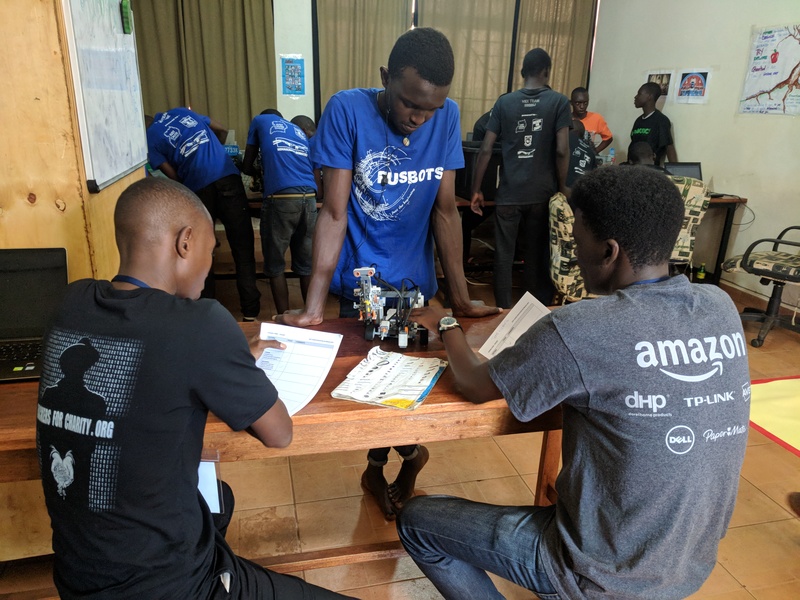 In addition, we were able to give Fusbots their own Arduino kit and extend them the offer to take part in the Kampala competition with J-Robotics this May. It was an awesome moment to hear the Fusbot team basically gasp when we told them about the kit and the competition and J-Robotics cheer wildly to have their new robo-friends go with them to the event! Volunteer referee & score keeper Liz receiving a big thank you from J-Robotics team captain Ronnie. We made a special presentation to our volunteers who were as thrilled as the kids were to receive their certificates, stickers & a special event branded notebook. Finally, the overall winning team was announced, and the team trophy awarded. Congratulations were in order to J-Robotics the 2017 inaugural JCEO Robotics Tournament Champions! By this time it was pretty late in the day, a little after 8pm (we had been there since 8am!) and we had to get the out of town students on their matatus to get home! It could be anywhere from a 3 to 6 hour trip so we needed them to move it. This was probably the biggest challenge of the day because none of the kids wanted to leave! They wanted to keep working, testing and playing with their robots on the field and in the arena zone. We basically pushed them out the door (with a good ol’ guilt trip) and managed to lock up and get out by 9:30 ourselves. Shots fired! Fusbots long-range shooter in action! What we love about the STEAM programs we are establishing in Uganda is that they are not “lesser versions” of the “real thing”. Our students are able to learn 21st century skills in an equal capacity as their overseas peer group as they are using the very same equipment and competing in the same events. They are able to witness this “sameness” when they are competing online together and it helped to make the tournament not only fair competition, but one that all of the teams felt equal in. The only disadvantage we are experiencing in Uganda compared to Canada with robotics programs, is finding replacement parts or things like rechargeable batteries and duct tape at times of the year when we do not have a way to get them there. So far this issue has been very minimal, but, we are trying to prepare as best we can for this possibility by keeping good track of which kits and parts are in which of the two makerspace locations. The students and our volunteer staff have been excellent caretakers in this regard and have been very much accountable for everything in the months we are absent. Thanks to the help of the students from Renaissance Robotics back in Canada, and a very generous IEEE Canada Foundation grant that we received this month, we were able to cover the costs of this tournament and obtain the needed equipment to ensure that all 3 teams had what they needed to take part and will be able to continue with more of these same events in the future. “When can we do this again? !” was a question asked at least 10 times before the event was even finished! One of the most rewarding parts of the whole tournament was seeing the volunteers and the students in action. 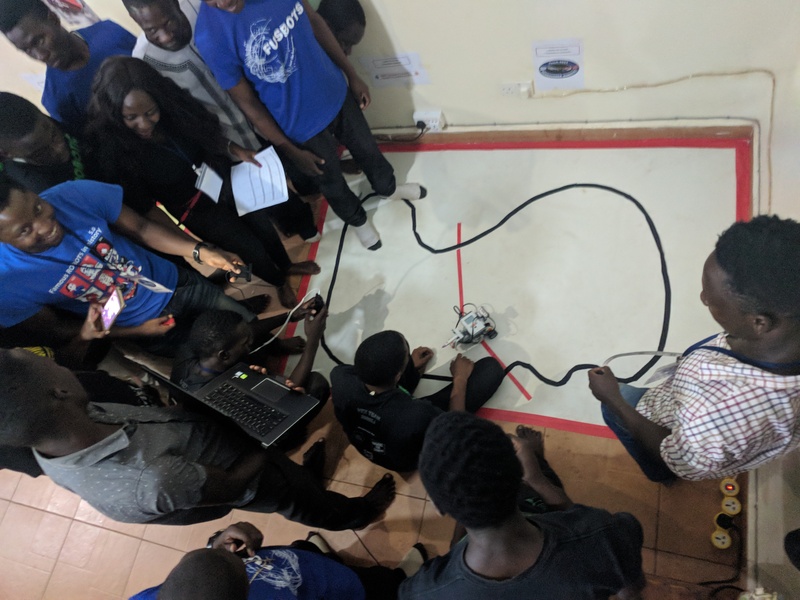 Our volunteers really had no idea about robotics, but we did a training session with them, had communicated with them regarding schedule and rules leading up to the event, and they really took the lead. They LOVED it — it was so obvious by how much ownership they took over their role. The learning that happened in this regard plus the fact we had all Ugandans running the event as volunteers, AND it all went so well, set a really important example for the students involved. 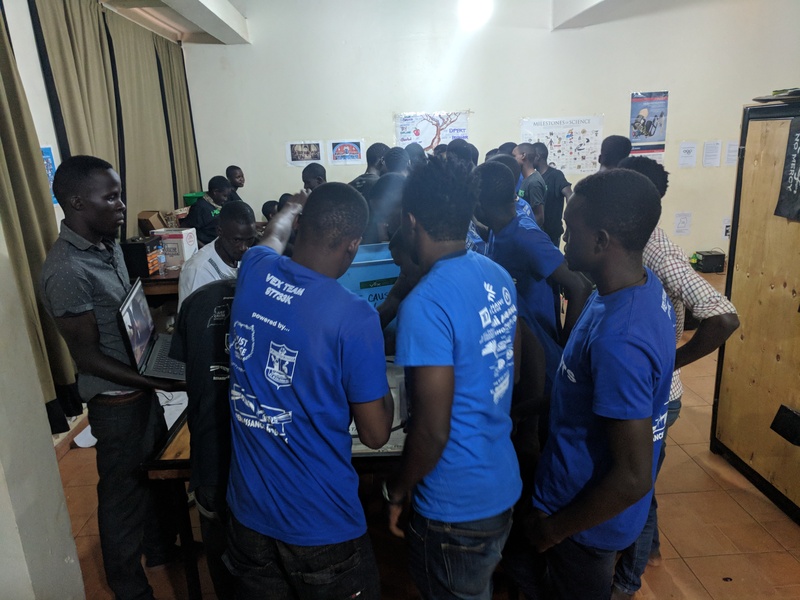 Between this and the genuine team-to-team collaboration, troubleshooting and helping out that we saw through the day as well as the friendships that have developed between the students, we are really feeling that we have started to establish a legitimate “youth tech community” in Uganda, just like we have at home. Again, an equal access opportunity. Lead programmer Samual (Fusbots) and Abubaker (J-Robotics) sharing coding secrets! Their posts on Facebook, Twitter, Instagram and the number of thank your emails and comments and Instant Messages we have received from the students and volunteers have been such an incredible testimony to how much fun everyone had and how truly appreciated the work was to put this on. This was just one more parallel to what happens at home in Canada after every tournament event with all of the pictures and selfies with medals and robots that saturate every participants newsfeed in the aftermath! We loved seeing all of these posts & messages! On Friday, we met with another group of about 50 students in a neighbouring town called “Bukiya” that inspired us to already make a plan to grow our programming further, yet again, this summer. We are planning to have the two existing teams run our original introductory workshops that they both went through for these new students, and possibly establishing a third team! What a tournament we could have then! More on that in July! 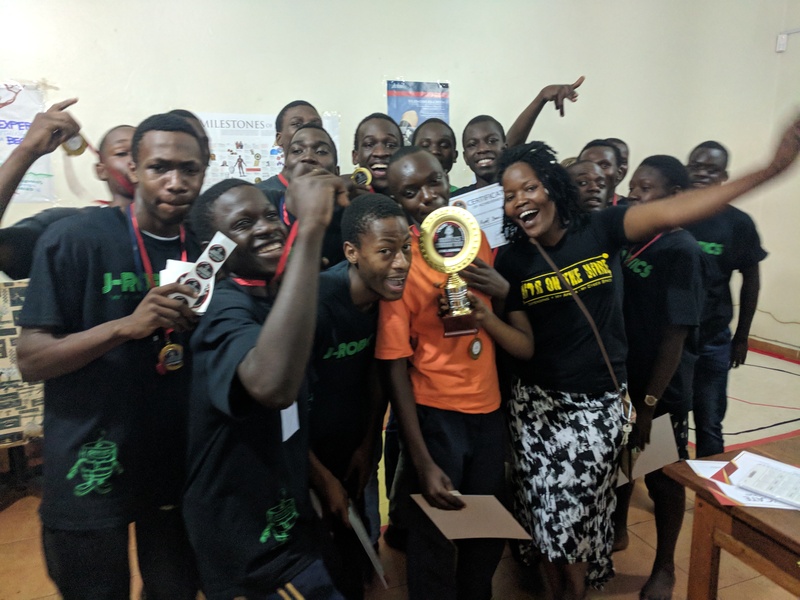 The other upcoming plan, other than GISU tech competition in May, is the students want to initiate a friendly competition with the students at Horizon International School that is in town that we met in Kampala last year with them. They want to do a coding challenge and something with Arduino since they both have the equipment. It was terrific that this was the J-Robotics kids’ own idea and they want to initiate it and organize it with just us to provide some adult advice and guidance. We love that they are not intimidated by the “rich kids” and do not feel at all disadvantaged or unequal. This makes us endlessly happy and really validates what we are doing. A huge thank you is in order to the IEEE Canada Foundation, Hacker’s for Charity and Renaissance Robotics for the support and generosity in making this event possible! It took 6.5 hrs to get from the Entebbe airport to Jinja on Friday night! The distance was not the problem, it’s only around 120km… With really inconvenient timing, some politician made a remark that the traffic in Kampala is due to traffic police not doing their job… Well, guess who decided to not show up Friday and prove a point! Regardless, arriving safe and sound in Jinja did eventually happen! With the help of Linda who still is the keeper of the keys, Saturday was spent assessing the space available and organizing Hacker’s for Charity Hackerspace where we will be hosting an official robotics tournament on Tuesday! We are so excited for this tournament because the J-Robotics team had been dying to compete again after their tremendous success in May at their first event, and our newest team, The Fusbots, have not had the chance to participate in an event yet and are really looking forward to this first opportunity! With just a couple days to prepare between arriving in Uganda and the event itself , it was a great suprise to find that the kids had made a real effort (with prodding from Linda we suspect 😉 ) to tidy, organize and clean up the Hackerspace last week! Of course they’re kids, and there is still so much to do, but between their efforts to check up and the certificate they presented to our organization on Saturday, we know just how much they truly cherish the place that they have to work, all of the equipment and the opportunity for hi-tech learning they’d never have access to anywhere else. There were some new members on their team that we got to meet and spend some time getting to know. As usual, the students worked non-stop, and had to be forced to leave at 8:30pm.